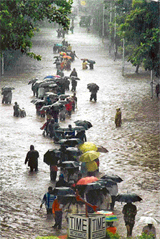 At least seven persons have died in Mumbai following heavy rains since Monday morning, according to information available with the Disaster Management Cell set up by the Maharashtra Government to oversee rescue and relief operations. Four migrant labourers and an Army driver were buried alive in a landslide which triggered due to blasting by the General Reserve Engineering Force (GREF) of the Border Roads Organisation (BRO) to widen the National Highway-22 near Khab today. Upset over the misuse of vehicles by senior Punjab Police officers, the Director-General of Police, Mr S.S. Virk, has ordered that no fuel should be provided for vehicles that are in excess of the original allocation to an officer. The rift between the Left parties and the UPA government appears to be widening with each passing day, with the Communists today deciding to intensify its attack on the Manmohan Singh government for its failure to check price rise and called up coalition partners in government to intervene on the disinvestment issue. Taking notice of the alleged incident of a Batala-based pregnant woman losing her baby due to the thrashing that she received at the hands of three Punjab Police personnel and a driver yesterday, the Punjab State Commission for Women today sought a status report from the SSP, Gurdaspur. The report will be submitted within seven days.